The governor of Illinois has announced plans to sell Helmut Jahn's James R Thompson Center in Chicago – a move that could lead to the demolition of the Postmodern government office building. Located in Chicago's core central business district, known as The Loop, the full block-long building by the German-born, Chicago-based architect is a prime candidate for redevelopment. The governor is proposing it be sold at public auction. "This building is ineffective," claimed governor Bruce Rauner in a news conference. "For the people who work here, all of whom are eager to move somewhere else, it's noisy. It's hard to meet with your colleagues. It's hard to move through the building, very ineffective, noise from downstairs, smells from the food court all get into the offices." The 17-storey, nearly one-million-square-foot (92,903 square meters) government centre opened in 1985, and is known for its canted and curved glass exterior and massive interior atrium containing a food court and transit entrance with offices arrayed above. "Hearkening back to the grand domes of earlier government structures, such as the state capitol in Springfield, the southeast profile is a slice of a hollow sphere, clad in curved blue glass and salmon-coloured steel," said the Chicago Architecture Foundation in its listing for the building. "The populist Postmodernism continues inside." The structure serves as the state government's Chicago headquarters – the Illinois state capital is Springfield. But maintenance problems, high operational costs, and functional issues have plagued the building since it opened. Rauner estimates the building needs $100 million (£64.7 million) worth of deferred repairs. In 2009, a large granite panel fell off one of the pedestrian arcades, prompting the removal the remaining slabs. The building has also been infested with pests. Rauner would relocate state workers to other offices spaces in the city, a move that could save the cash-strapped state up to $12 million (£7.8 million) annually, according to the Chicago Tribune. Jahn accused the state of deliberately letting the building fall into disrepair, telling the Chicago Tribune that since the building opened maintenance "has not been upheld by the administrations that followed." He called for the building to be repurposed by adding a hotel or apartments and for an upgrade to make the food court more upscale. Though Chicago is renowned for its modern architectural legacy, it has a mixed record on preserving its iconic structures. The city recently allowed Northwestern University to demolish Bertrand Goldberg's old Prentice Women's Hospital, a concrete cloverleaf-shaped Brutalist building. Jahn has designed towers and institutional buildings around the world, including the Veer Towers in Las Vegas, the Sign Dusseldorf tower in Germany, and Manuesto Library at the University of Chicago. He worked with Charles F Murphy and later became his partner in the firm Murphy/Jahn. The firm is now known as JAHN. 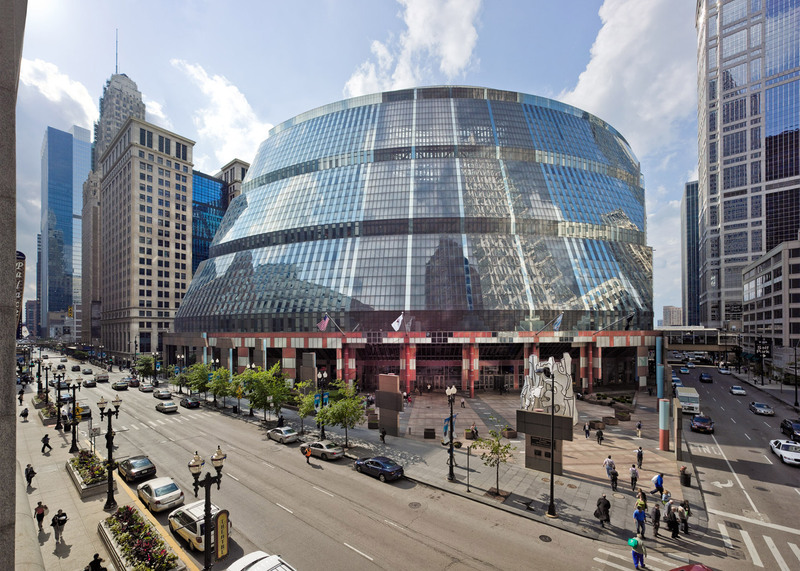 The James R Thompson Center is the second significant Postmodern US government building to be threatened with demolition in recent years due to high operational costs and functional issues. Michael Graves' Portland Building was spared the wrecking ball shortly before his death earlier this year.